There’s been some chatter here and across the seas about just junking it, BBC on old pianos Cordelia Hebblethwaite is one heck of a journalist. The family heirloom upright piano is now in the basement of the house where we’re packing up the last few years. That’s right. It’s been around, but it’s been here in the basement for what actually is quite some time now. That means quite a while. It’s been down here, with stuff on it, for quite a while. Stuff that also has to get out of here. And it’s time to get moving. And if that doesn’t work for you here’s another shot. It’s a “Weber” made in Kingston, Ontario. Serial number 29459. It was the piano in the family home when the kids were growing up. Then, years later, it was in the new home of one of the parent’s of those kids. Then it was in the home of one of those kids, who’d grown up but still played the piano. Then it was back with the mother of those kids. The ping-pong table had to come down in the basement and the piano was taking over. I don’t think it was ever played too much down in that cramped basement that was already full of a lot of other stuff. I can tell you this. There was no more ping pong. But throwing out a piano can be an unlucky act and generate generations of bad luck for the perpetrators of this outrage and their descendants. If that isn’t correct maybe it should be? You can’t throw me out. I’m a musical instrument. If there’s not too many descendants, maybe no problem. 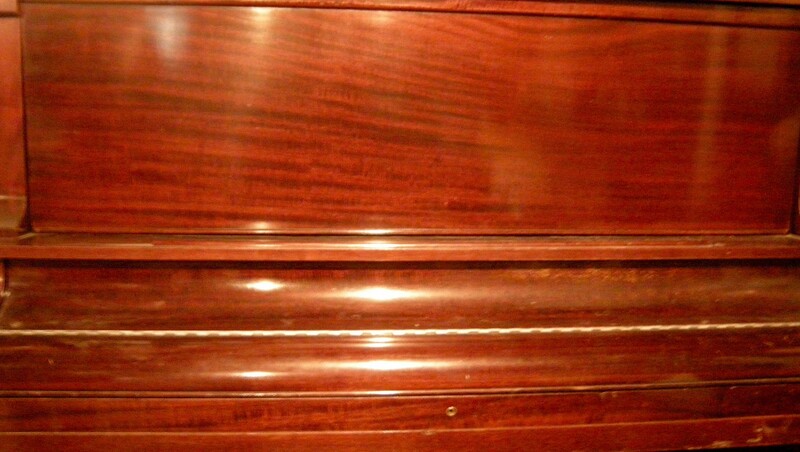 But we still have to deal with this piano so we are, or I am, here to tell you about a free upright piano that does need a bit of work, tuning for sure, but is a mature, fine looking wooden shiny mahogany upright piano needing tuning, as I say, and some key repair. That could even be key “repairs”. Doesn’t matter. Won’t be cheap. What I’m proposing is that you call me, direct, at samoyeddogs if either you or anyone you know is in a desperate struggle to obtain a pre-owned upright piano of some 60 or so years, absolutely free of charge. I hate to say it, but this offer may never be repeated. This is a serious offer and no reasonable offer will be refused. Pretty sure. The real work of dissolution. Not some fantasy. Do you want to take up this piano’s cause and make it your own? Or watch it die like a dog in the ditch? Delivery terms can be arranged but this fine musical instrument, ready to walk out the door with you, is absolutely free. Welcome! Tickle my ivories. This entry was posted in Absurdities, Certainties and tagged BBC, Cordelia Hebblethwaite, Kingston, Ontario, Upright Pianos, Weber piano. Bookmark the permalink.